First of all, thanks so much to those who left comments on the blog as well as FB about the master bedroom. Comments make our day, just to let you know. It's kinda that virtual pat on the back that everyone needs from time to time. So thanks:) It was fun reading through each and every one. And we're thrilled you all like it! We are definitely proud of how it turned out. Actually as I was looking through that last post, it brought tears to my eyes seeing how far we've come. Man...what a journey it's been! And thank YOU for tagging along in this journey with us. It's been really fun sharing progress and now completed projects with you. You guys are awesome. These detailed posts can be quite lengthy so I decided to break it up into two posts. Okay, I just grabbed me a glass of grape juice...let's do this. I'm just sharing details of the bedroom today. 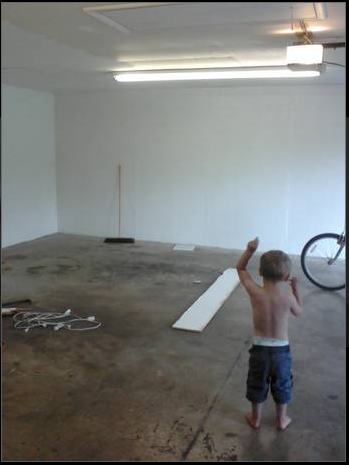 I'll save other details about the entire process of renovating our garage for another post. This is what we started with: a basic two car garage, fabulous florescent lighting and a lovely concrete floor. The walls are Ben Moore Revere Pewter (eggshell finish). The trim, wardrobes, and barn door are Ben Moore Dragon's Breath (semi-gloss). The ceiling is painted Ben Moore Titanium (flat finish). That's the same color as our living room. I wanted all the colors of our house to flow. And I'm all about calming, serene colors these days:) The ceiling is the lightest shade of blue/gray. It's nice and subtle. I received lots of questions about the barn door. That's definitely one of my favorite features of the room. For those who are new, I found this door for sale alongside the road. When I saw it, I literally made a U-turn right then and there and pulled into this guy's driveway. The house from which it came, was being torn down and the owners were selling random things, among them, this door. You can see what the door used to look like here. I was asked what hardware we used. Well, this door actually used to function in between the wall as a pocket door (in its former house). Back in the day, when you wanted to close off your parlor, you'd simply pull the door shut from inside the wall. And when you wanted one big open space, you slid the door back, and it fit snugly into the wall. The track it hangs from was covered up I suppose by the ceiling originally, but of course we wanted our "barn door" to be a focal point in the room thus we hung it on the wall as opposed to inside the wall. The track came with the door and after discussing with our neighbor (thanks, Jim!) how we were going to hang it, he suggested we simply bolt the track right into the studs. Easy enough! (well easy for me to say--that door is solid wood and HEAVY and it was just Mitch and his Dad who installed it.) Mitch actually screwed a board into the studs (it's painted the same color as the wall) then bolted the track through the board into the studs. He used 5" bolts. That puppy ain't goin' nowhere! I just left the original hardware (pretty sure the handle isn't original) on it since I loved the patina of it. The lock part doesn't work, but originally, you could lock the pocket door shut when you closed it. For those who want to create a barn door look for your home, I know Tractor Supply carries the hardware to hang it, but I know that it can add up pretty fast! Check Pinterest for some ideas too. Next up: our wardrobes. This was a design decision that was made pretty early on. You wouldn't believe how many people tried to convince me to build a walk-in closet. Okay, it was like three people, but still. I knew we couldn't make a walk-in. The layout of the room would not accommodate one. Plus, unless it's a WALK IN (you know what I mean...like an entire room), I really didn't care to have one. We had seen some wardrobes at Ikea that we liked. At least until we saw them in person. You can read about it here. So then we decided to call Adin, our cabinetmaker, and have him build some for us. I think it was a great decision. We love how they look and function. I'll do a post later about the insides of the wardrobes. The space in between the wardrobes was totally based on this little dresser that I found at an antique store. I loved it the second I saw it. Mitch went back and bought it for me. I think it was a Christmas present (that I didn't know about!) one year. So I knew I wanted that little guy in between the wardrobes to break up the cabinetry. We found the electric fireplace on line one day (it was on one of these one-day sale websites) and it was the perfect size. Love the modern touch it brings to the room. And I also love how the mirror around the fireplace ties in with the hardware of the wardrobe. An unplanned coincidence. I love mirrors, just in case you haven't noticed. I love using them in every room of our house. They really are the perfect filler for a wall. Have an empty wall that needs something? Stick a mirror on it! You can't go wrong. This mirror we created out of what used to be a mantel (that's what the antique dealer told me when I bought it). When I saw it I knew I could turn it into the perfect mirror. There was a problem with this particular mirror though. You can read about it in my last love/hate list. Long story short: the problem is fixed. I don't have a cheap-looking mirror in there any more. And we love the crusty goodness this mirror brings to the space. Another mirror we have in the bedroom is our DIY driftwood mirror that hangs above our bed. Love it. And the last mirror in the room is the one on my dresser. I'll tell you the story behind our furniture in my next post when I talk about our bed. It's pretty cool. The bird art was leftover from the living room gallery wall project. And the decorative shelf was a yard sale find. It was 25 cents:) The little wreath was actually from our wedding. Instead of a pillow, the ring bearer carried that tiny wreath that had our rings attached to it with ribbon. Okay, that's all for now. Part two coming soon! Gorgeous, gorgeous, gorgeous. I love the soft blues you chose that compliment the wood floor and furniture. The barn door is fabulous (where does it go to? I assumed it was the entry door, but then you showed it as well). The wardrobes were a fantastic idea and remind me of the cabinets Sarah Richardson had built on either side of a dresser in the entry room of her farmhouse (did you see photos of that?). I bet you are enjoying your beautiful new space. The barn door goes to the master bath. That reveal is coming soon:) And yes, I know which cabinets you're talking about. I loved those. Sarah is a favorite designer of mine:) Thanks for your comment! It's all soooo perfect! What good ideas and such great color. I love to recycle architectural material like doors, knobs, molding. You've certainly got that down to a science- I love the doors! Awesome master bedroom! Those photos will tell it all. Great work with the interior design. The furniture made the room perfect.